I am officially in love with this part of New York. Walking the Brooklyn Bridge and being almost ran over by cyclists (still don’t understand how can you cycle in NYC!? ), I descended on the opposite side from Manhattan. Brooklyn Bridge Park is a lovely place and I suggest taking a stroll there for the views. You can also play basketball with the Brooklyn kids there and creep the Statue of Liberty through the magnifying lens thingy on the quay. 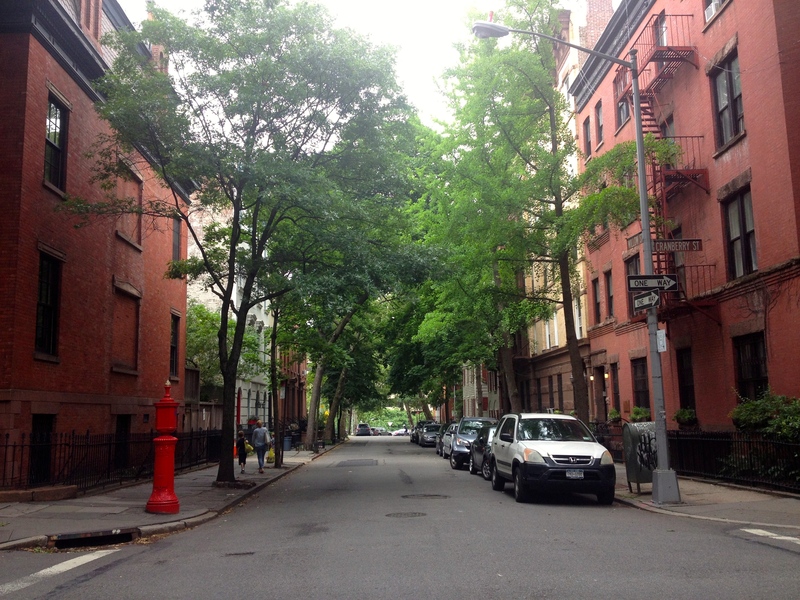 Next head inland to wander around the Brooklyn Heights – the historical district of the city. If you are a lover of brick buildings and cozy streets, you’ll enjoy it as much as I did. 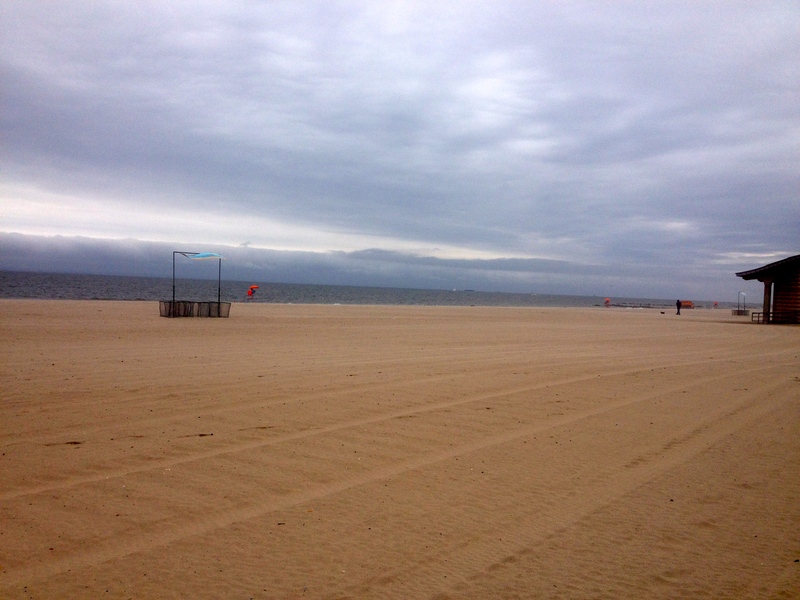 Russian me could not have missed going to Brighton Beach, which was a train ride away south from the Heights. For those of you who don’t know, BB is the heart of Russian speaking community in New York and it’s almost scary how actually Russian it is. I felt like back home with everyone looking and speaking Russian, with posters in Russian, and Russian restaurants. The beach itself I’m sure was amazing in summer, but the wind there almost blew me away at that time so I hurried back to Manhattan. SoHo is the shopping, cafes and hipsters part of NYC. Even the name “SoHo” sounds fancy. I met my old friend in the Cafe Select on the Lafayette street. Catching up over the glass of wine and listening to the buzzing streets is a lovely way to spend an evening! After, we walked under the arch in Washington Square park (the prettiest NYC park in my opinion). Apparently, if you are a New York University student it is considered bad luck walking under it, but we were safe. If you are in the West Village that night, have a pisco sour on W 8th in the Village Pisco. They are famous for those and, damn, those are good (and I don’t like sour)! A well-known fact that you can’t see the stars in New York because “everything is a skyscraper” and millions of lights don’t let the stars shine. Manhattan feels like a start itself, though… Last stop of the night, my friend took me to the quay in Williamsburg (another lovely area of Brooklyn) at night. Manhattan was shining and we were talking about the hurricane Sandy and how vulnerable this city is to the floods and other natural disasters. Did you know that the Empire State building lights up different colours every night? I wasn’t able to snap a picture, as my phone wouldn’t be able to reproduce the beauty of the night. You’ll have to see for yourself.